When should women who want to advance professionally have children? 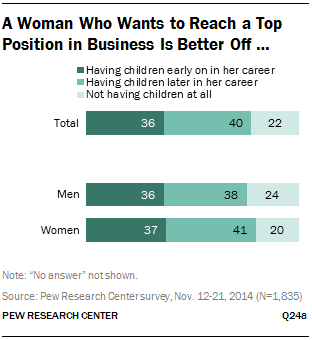 The public is split — 36% say that having kids early in her career is the way to go for a woman who wants to “reach a top executive position,” while 40% say it’s better for a woman to hold off until she’s well established in her career. And another one-fifth say that women who want to advance up the career ladder should not have kids at all, according to a new Pew Research Center survey. But what are U.S. women — particularly those well-positioned to pursue a career — actually doing when it comes to building their families? Among women ages 40 to 50, the median age at which those with a master’s degree or more first became mothers now stands at 30, according to a new Pew Research Center analysis of census data. In comparison, the median age at first birth for women with a high school diploma or less is just 24. The data show that more than half (54%) of mothers near the end of their childbearing years with at least a master’s degree had their first child after their 20s. In fact, one-fifth didn’t become mothers until they were at least 35. Some 28% became moms in their late 20s, and 18% had children earlier in their lives. Among mothers with a bachelor’s degree, fully 40% were past their 20s when they had their first child, and 14% were at least 35. While many highly educated women are delaying motherhood, some are foregoing motherhood altogether. About a quarter of women near the end of their childbearing years with at least a master’s degree have not had children, according to an earlier Pew Research Center analysis. These patterns of childbearing contrast dramatically with those of less educated women. Among mothers who did not attend college, the majority — 62% — had their first child before they reached the age of 25, and 17% became moms in their teens. Just 16% delayed childbearing until their 30s or later. Even among mothers who have some experience in college (but lack a bachelor’s degree), just 21% were 30 years or older when they had their first child. About half — 49% — were less than 25 when their first child arrived, and another 29% were in their late 20s. Less than two-in-ten women who lack a bachelor’s degree are childless. A 2013 Pew Research survey found that working mothers are much more likely than working fathers to say that family obligations interrupted their own career advancement, suggesting that balancing work life with the responsibilities of caring for a baby is an important consideration for women who want to move ahead. However, the new Pew Research survey found that when asked to identify the major reasons why there aren’t more women in top leadership positions, Americans point to women being held to a higher standard than men (43%) or companies being unready to hire more female leaders (43%). Only 23% see family responsibilities that conflict with work as a major reason for the current lack of women in top business positions.